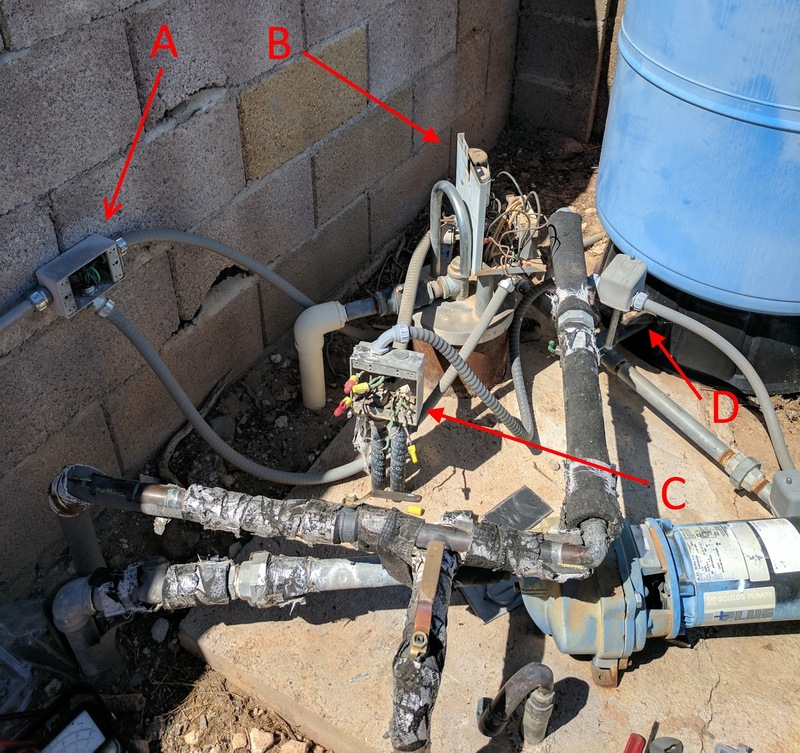 The connection box A is where the float connects at the left hand side, on the right is 220 VAC coming in from the main panel, and both go down the bottom conduit over to the pump controller box labeled B. The connection to the bottom pump is inside the controller box where the yellow wires are. 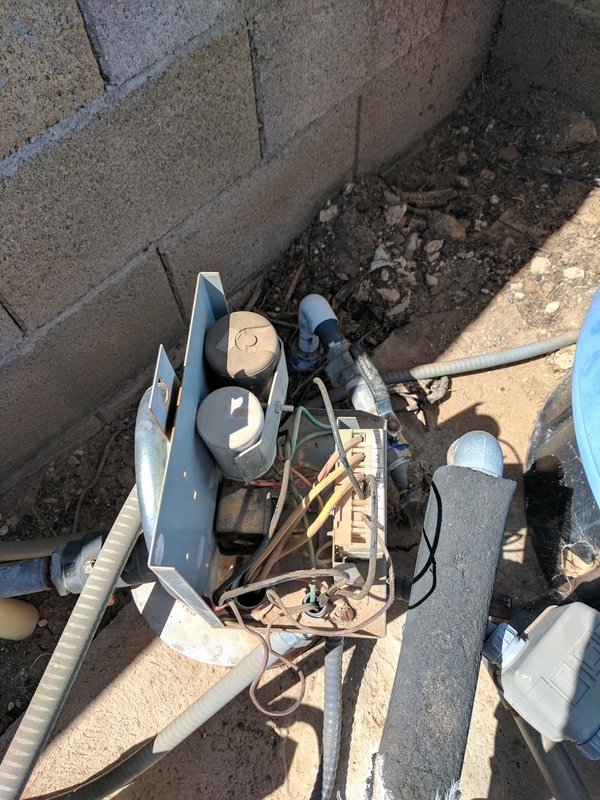 Then there is a conduit to a box that is attached to two pipes coming out of the concrete labeled C. This piece of flexible weatherproof conduit literally bends around the well vent pipe and was actually crushed. I'll talk more about that vent pipe when I get to the plumbing fiasco. From box C a conduit runs to a pressure switch labeled D, continues through the switch to ANOTHER pressure switch on the lower right. Notice the the lamp cord actually travels into the controller on the lower end. 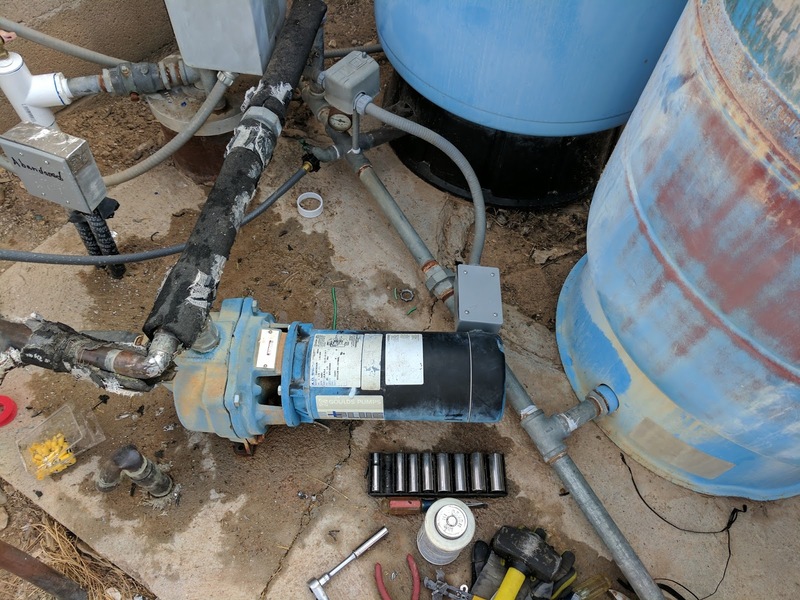 When I had everything open, it was a bit frustrating because the main source of 220 for the bottom pump was carried through those wires. 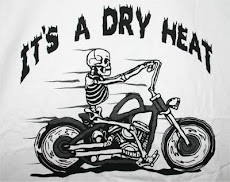 Motors don't like big voltage drops across the wiring, it tends to make them run hot. After checking with the neighbors and reviewing the history of our houses, it turns out that those wires were from the original house on the land. There was only one house and the wires went up to the main panel on the house. There was no need for the wiring any longer, but it was still connected at that house. Someone just used the conduit path through the box for wires because it was too much work to move the conduit. Notice the cover on the lower right. This cover used to be on the box held carefully in place with duct tape that had rotted in the sun. There were no outlets under the cover even though there were outlet lids on the cover. Yep, the wires had gotten hot. I pulled on the wires and one of the fell out. Let this be a lesson to you, make darn sure the wire nuts actually connect to all the wires. Eventually this would have arced enough to fail and I would have been out there, in the dark, probably when it was either super hot or raining, fixing this stupid connection. It wouldn't have caused a fire unless the dried and crumbling duct tape happened to catch. Just an annoyance. Now, about the pressure switches. Notice I used the plural. There were two pressure switches in series on the system. One was attached to the surface pump and the other was fed water pressure by the house supply line. Why two? Isn't it obvious? 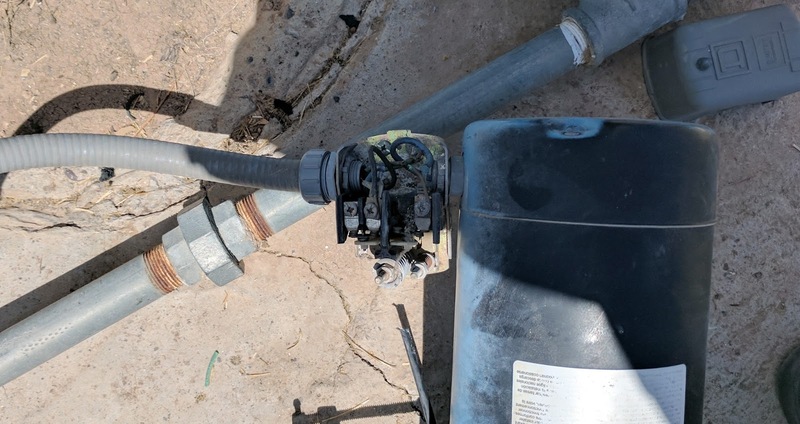 The pumps often come with a pressure switch attached, but since the system already had one reading the house supply line, and it was too hard to remove one of them, they wired them in series. Jerks. If you look closely you'll notice that one terminal set for the wiring is completely gone and the wires have been hooked together under the screws. 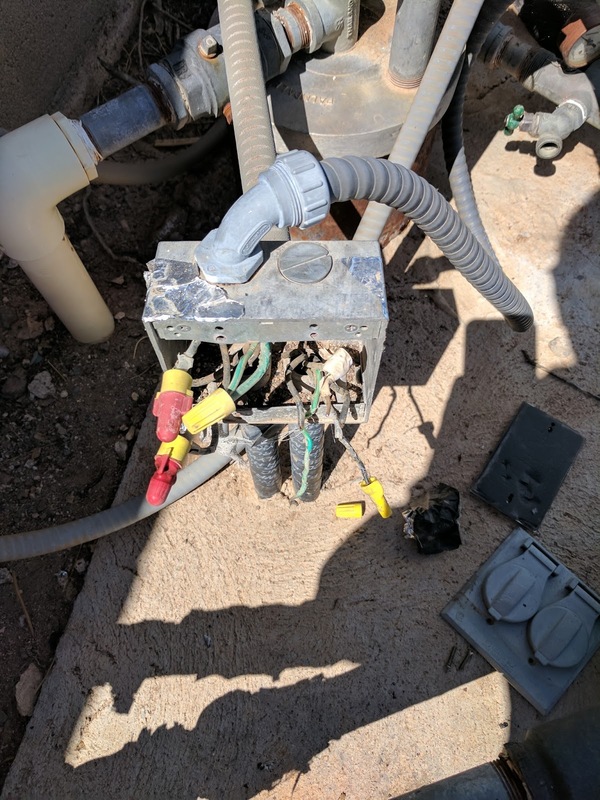 When the extra pressure switch failed, they just used it as a connection point for the wiring. I actually remember when this happened. A random ant got into the switch and was crushed by the contacts. That left the smell of crushed, cooked ant for other ants to follow. The switch was filled with ants looking around, and in short order more of them got killed by the action of the switch. The formic acid in the ants ate the contacts and serious arcing destroyed the internals of the switch. Yes, the guy in charge of the well called out a repairman, but the repairman took the easy way out. To actually remove that switch I had to clamp off the water feed tube (that black tube on the left of the pump), and put in a 1/4 inch pipe plug. How many of us have a 1/4 inch pipe plug in our junk box out in the garage? 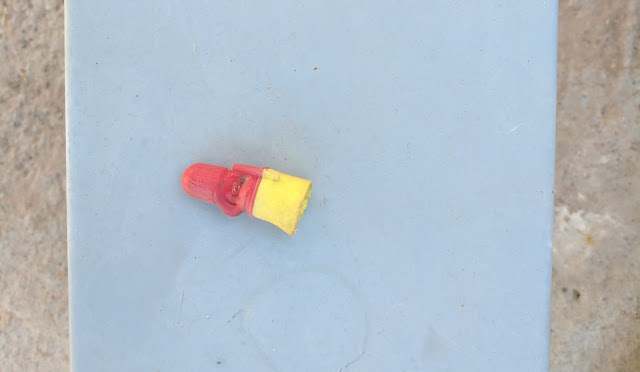 That was another trip to Home Depot; I'd already been there for a box to contain the connections that would replace the extra pressure switch. Over a few days, I rewired almost every connection. I ran in a 110 VAC pair to power outlets for tools, took the conduit with the kink completely out, rerouted the wiring for the pressure switch (singular now) and put in new electrical boxes to handle all of it. Towards the end of the project I got a neighbor down to help pulling wires and another one came over to see what was going on and got enlisted to help. I made all the major connections in a box I put on the wall and ran 220 wire pairs down to the controller. Every single box has a ground leading back to the panel, something that was in short supply before. I also put in two 220 VAC switches to control the two pumps. This is a really nice feature when you need to work on part of the well. It was really nice having a couple of extra sets of hands during that part of the project. Over on the left is the box that is wired to one of the houses. It's closed off and labeled. I wrapped metal tape around the top of it because I didn't trust the seal on the box; a little extra sealing is never a bad thing out in the weather. Also, notice that there are a lot less conduits with circular wiring. In the top center is the pressure switch that runs the surface pump. It must have been a real problem trying to set the water pressure back when both pressure switches were active. One would interfere with the other and you wouldn't be able to tell which one was causing problems. Now, setting the single switch is simple. Of course, I wasn't just working on the electrical, during this process I was also attacking some pretty serious screw ups in the plumbing. That's in the next post. Here in Texas you have to have a cutoff switch near the pumps. Typically they put a small breaker box near it and use the breakers for that purpose. It's supposed to be a safety feature. We don't have to do that here, as long as the main panel is a short distance away. I put in switches though, mostly because I wanted better control of the pumps.